Dressed in a Barbie costume, one little girl spent all of Halloween evening running from house to house on her tiptoes! Her Daddy kept asking her why she was doing that and cautioning her she was going to fall. The answer was simple: "Barbie only walks on her tiptoes!" Thus, another generation of women with foot problems is already in the making. According to the American Academy of Orthopedic Surgeons (AAOS), Americans are spending in excess of $2 billion a year to have foot surgery, and about $3.5 billion if you include the costs of recovery and being off work. While genetics can provide a predisposition towards developing foot problems, the real culprit is women's shoes. As the AAOS points out, "Improperly-fitting shoes, which can cause bunions, corns, calluses, hammertoes, and other disabling foot problems, are a huge public health risk in the U.S....One in six persons or 43.1 million people in the U.S. have foot problems. Thirty-six percent regard their foot problems as serious enough to warrant medical attention." Furthermore, the AAOS reports that women are nine times more likely to develop a foot problem because of improper fitting shoes than a man. 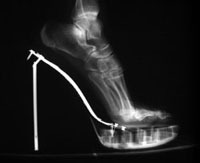 They are willing to wear shoes which are painful, which are too small for their feet, and which put their feet in positions not intended to support their weight (ie: high heels). Prolonged wearing can lead to Bunions, Hammertoes, Morton's Neuroma, and Achilles tendon shortening and tendonitis. To understand how your shoes affect your feet, you need to understand that the foot has 26 different bones and 33 separate joints, all held together by 107 ligaments, 20 muscles, and many tendons and nerves. These moving parts are designed to work together in a very precise way. To protect the foot, choose heels which are 2.25 inches high or less. Limit the amount of time you wear a high heel any higher. Just as in machinery, if one working part is out of alignment, bad things eventually can happen. The higher the heel and the more pointed the toe, the more each part of the foot is out of alignment. Both the American Academy of Orthopedic Surgeons (AAOS) and the American Orthopaedic Foot and Ankle Society (AOFAS) recommend women never choose a shoe that feels too tight or too short, or that squeezes the toes. Instead, women should choose a shoe that conforms to the shape of their feet, meaning a shoe that is wide enough to allow the toes to move and that matches the natural arch of the foot. Both professional orthopedic organizations recommend wearing shoes which can provide some cushion to the feet as one moves. Both also strongly state that women should avoid shoes that are too short and too high -- meaning heels that are greater than 2 1/4 inches. Another problem with high heels is that frequent-to-daily wear can lead to a shortening of the Achilles tendon, which will eventually cause heel problems such as plantar fasciitis, and forefoot pain from calluses and pinched nerves in the toes. It helps when my patients come to understand the difference between "a fashion statement" and "footwear". Footwear is shoes designed to protect the feet and to improve your performance. Reasonable footwear can be worn all day and not hurt your feet and not put you at risk of injuring yourself. A fashion statement is something you endure to make a point. "Fashion statement" shoes may project a desired image, but the price you will pay can be big in terms of future health care bills and of pain -- some immediately from discomfort, and some a lot later from the damaged joints in your feet. With a little thought while trying on shoes, women can find appropriate shoes to serve all of their professional needs and most of their social needs. At least twice a year, have both feet measured by a salesperson while you stand up. Select shoes for your larger, wider foot. Wriggle your toes inside the shoe, confirming they are not crowded together. Check the back of the shoe to be sure it will stay snug on your foot, but not too tightly. And shop later in the day when your foot will be a little bigger from natural daytime swelling. Put both shoes on and walk around the store. If they are not comfortable now, they never will be. Do not count on "breaking them in." Choose shoes which have a supportative sole and which bends across the ball of the foot. If you must have a high heel, select new high heels about 1/2 to 1 inch lower than what you have been wearing to reduce stress to your foot and to improve your stability when walking. Ballet flats provide no support. They may be cute, but cannot protect the foot because the shoe bends where your foot does not. Alternate the height of your heels from one day to the next, and consider changing your shoes once or twice during the day to reduce pressure on the various parts of your feet. Switch to a good athletic shoe as soon as you get home, and wear athletic shoes on the weekends as much as possible. Some of women's most popular shoes today really should not count as shoes, even though they are sold in shoe stores. Ballet flats, which many ladies think are more "sensible shoes" have no arch protection and soles which are too thin. Flip-flops provide no protection or support for the foot at all. Except for walking on hot pavement, you might as well be barefoot. Risk of injury is directly proportional to the height of the platform, which can cause tripping and twisting of an ankle, and the height of the heel, which can cause numerous problems, including those related to posture. I long ago lost count of how many times I have heard "I fell off my shoe" in describing how a patient got hurt. When you plan to wear really high heels for a dressy occasion, leave the house in more comfortable shoes and don't put on your heels until you get to your destination. Change out of your heels as soon as you leave the event and are back in your car. My final thought is that most ladies organize their shoes by color or by purpose. Try organizing your shoes according to comfort versus pain. It will help you make a more conscious choice about your shoe selection each day and to know what that choice is going to do to your feet.